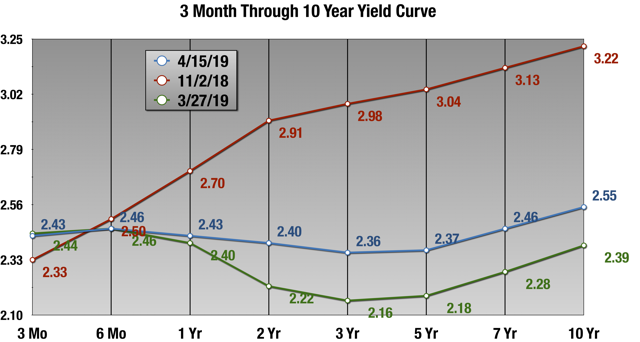 The trend in yield curve spreads continues to be negative, though the rate of change has slowed considerably. The note and bill yields have become detached. The changes in the spread is being driven by the notes, the rates least in the Fed's control. The 6-Month Spike indicates investors believe rates will hold steady and then fall 6 months from now. Models based around the yield curve are starting to predict recessions coming sooner rather than later. The earliest seems to be the Q1 of 2020. The price of consumer and corporate risk had been rising, but 2019 has seen a reversal of that. I’ve been publishing on the yield curve since November, and in that time, the curve has undergone some changes. All yield data comes from your good friends, the economists at the US Treasury. For some time, the most obvious feature of the curve was the 2-Year Elbow, seen here at 2.91% on the red line from November. The curve had that basic shape for most of 2018, until the very end. Then the 2-5 inverted, then the 1-Year Spike formed, and now we see that the 6-Month Spike has formed, with it flat or inverted all the way to the 7-Year. Currently (blue line), the 6-Month to 3-Year spread is -10 bps. I don’t need to fit a line to show you how much the curve has flattened — just eyeball it. Eek. But I’ve also included the peak of the ferocious debt rally at the end of March (green line). The 6-month to 10-year spread was -7 bps and the 6-month to 3-year was a whopping -40 bps. As you can see, by mid April the spreads have backed off that considerably, pretty much back to where we were a month ago when I wrote my March update. While still much-declined, the 10-Year has backed off considerably, up 16 bps in about 2 weeks. The Spike is inverted or flat through the 7-Year. The 2 through 5-Year are flat or inverted with the effective Fed Funds rate. Double eek. The obvious explanation is that market participants are anticipating Fed standing pat through the next 6 months, and then easing thereafter. This aligns with many predictions, including my own, of a US recession coming at the beginning of next year. The inversion of the 2-10 yield curve has preceded the previous 6 recessions by 6-24 months, usually closer to 6 months. To be clear, this is a symptom, not the cause of recessions (though narrowing spreads will effect bank bottom lines), but it seems to be one of the more reliable predictive variables in this respect. The trend has been for a 2-10 inversion in Q2 or Q3 for some time now. The Fed uses a model based around the 3-month through 10-year spread, which has undergone even more radical changes recently, and we will get to that. 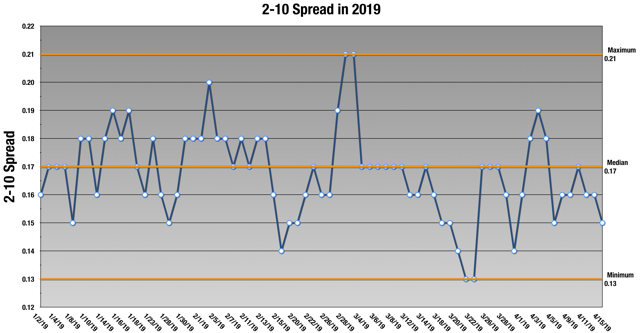 I’ve been maintaining a simple daily regression model of the yield curve since early 2018, focused on the 2-10 spread. The spread peaked on New Year’s Eve 2013, and has been declining in a fairly linear fashion since. The model has been predicting a 0.15-0.16 bps/day drop in the spread since mid-2017. The current model prediction is that the 2-10 spread will flatten on August 31, about 25 days later than last month’s prediction, which as you can see in the chart below, dipped pretty low during the December swoon. It is currently well past the the median model prediction of June 23. The current prediction is for recession in about a year at the earliest, and Q4 2021 at the latest. I think weakness in the rest of the world is going to drag us down throughout the year and it will be closer to the early part of that range. It’s been a pretty narrow range all year, with most days closing between 15 and 19 bps. Remember, the curve was undergoing rapid changes during this period, including a fierce late March rally, but this spread barely moved. 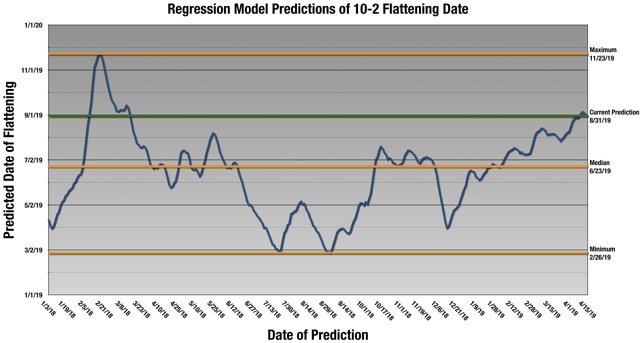 So the effect on the model is to keep pushing the predicted date of flattening out and, at the same time, slowly flattening the rate of change. The net effect is that in the 3½ months of 2019, the prediction has slowly pushed out 2½ months. 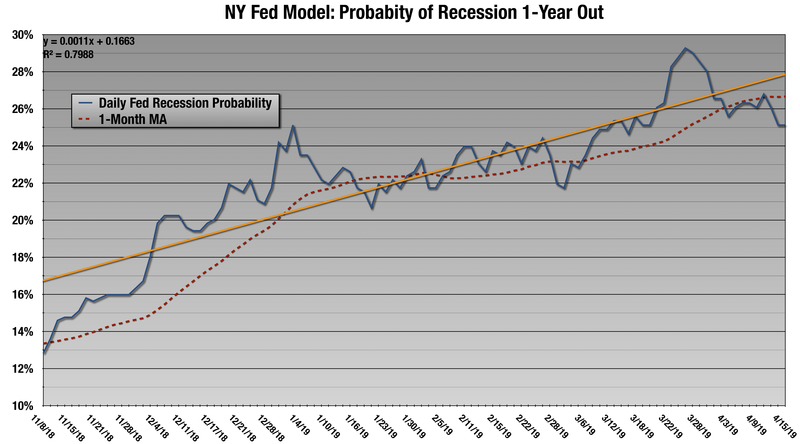 The New York Fed also has a yield-curve based model for recession. Because they’re the Fed, and I’m just me, we should probably have a look, right? The Fed’s model is based on the 3-month to 10-year spread, not the 2-10 as is more commonly used discussed, and they provide some very good evidence of the efficacy of the 3-month to 10-year as a predictor of recession a year out. Because of this I will also be keeping track of that as we head into the home stretch here. In contrast to the 2-10 spread, which as we saw has been standing still all year, the spreads between the 10 year and bill-maturities has been on a roller-coaster ride. In any event this next chart from the Fed takes us through the end of March and we can see that, while the back-testing is OK, it looks a little slow to react to changes in the spread in some recessions. We can also see some false-positives in the 1990s. The 3-month to 10-year has been declining rapidly in the last 5 months, going from 89 bps in early November to 24 bps at the close of the year to 9 bps at the close on Friday. However, during March’s rally, the spread was inverted for five days, with the spread bottoming out at -7 bps on 3/27. So the Fed’s prediction here, made at the end of March, is a little anomalous. 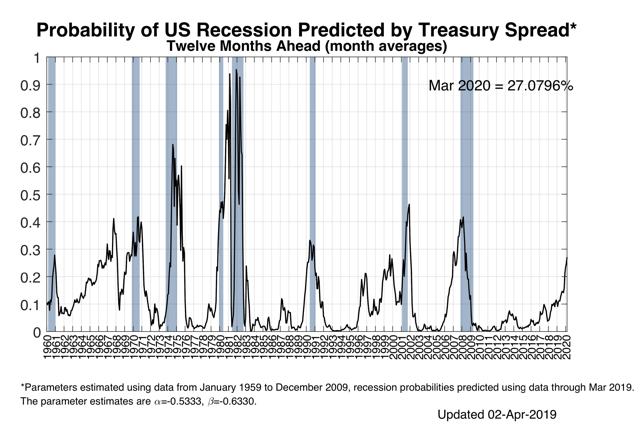 It puts the probability of recession in March 2020 at around 27%, up 2% from their February 2020 prediction. 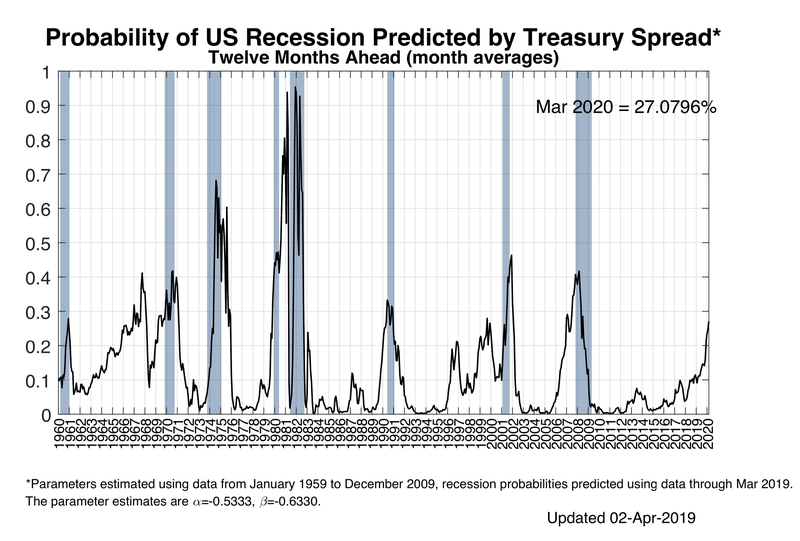 But the spread has backed off in the last two weeks so that probability for April 15, 2020 sits at 25%, roughly the same as the February 2020 prediction. Let’s zoom in on the last few months there where the probability has spiked considerably. Oof. But this is not to pick on Kudlow, except for his terrible prose, because many, many people and computer models smarter than both of us missed this one too. Expect more of the same this time around. Since the Fed announced they were pausing the balance sheet runoff in the fall, I have been referring to it as Backdoor QE4. I really need to stop, because it’s an overstatement, but it’s still sort of true. Someone help me out with a better name for this. When the the Fed stops the balance sheet runoff they will be back in the business of buying Treasuries. Notes on their balance sheet are constantly maturing and if they want to keep their net holdings unchanged, they will have to replace them. A large part of the runoff is just not replacing these maturing notes. Of course this will look different in the fall, but here is the current distribution of under-year maturities. To be clear, this is just an example of how this will likely shake down in the fall, using last week’s data, not what will happen. So within a year, the Fed has $378 billion in expiring notes to replace, about 30% of that in the next 90 days. If they were to stop the runoff here (which they are not, to be clear) they would be back to adding pretty large bids to Treasury auctions, though not on the scale of QE3. In any event, within a year, about 18% of the Fed’s balance sheet would need to be recycled in this manner to stay at net zero change. I don’t know if they will do this, but the Fed can also act more like a regular bank in this process and arbitrage maturity spreads. For example, right now the 6-month to 3-year spread is -10 bps. Instead of replacing expiring 3-year notes with new ones, they can buy the 6-month bill and get an extra 10 bps. But the big benefit of trading note for bill in the current inverted environment is that it will add demand to the 6-month, suppressing that spiked rate a bit, and reducing downward pressure on the middle of the curve where the trough is. Additionally, it gives the Fed six months to reassess what they want to do with that tranche of liquidity. This spread can be seen as the price of the implicit risk of lending to the consumers on the most vanilla type of mortgage. A bank has cash and they want to lend it at a 30-year fixed rate. They can lend it to the US Treasury at almost zero risk. Or they can lend it to a homebuyer and get a higher rate, but more risk of default and early repayment. So when the spread is low, banks think these risks are low; when the spread is high, or rising, banks think these risks are increasing. After a lot of up and down in the early part of the cycle, around 2015 this noisy data set settled into the 100 bps range. 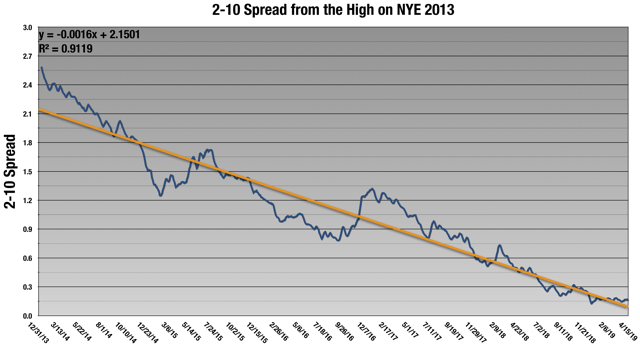 Then, at the end of 2017 through the end of Q2 the spread found a new equilibrium in the 150 bps range. But 2019 has been risk-on in the mortgage market, and we will mostly see this on all of the spreads in this section. In the historical data, the spread rose sharply going into recession, so it will be interesting to see how this progresses as growth slows and we move towards recession, and I will be keeping an eye out for similar movements like H1 2018. As we see, after a period where the implied risk was zero or negative, it jumped, but has now returned to levels from a year ago. After a decline in 2019 we are back to the high levels of late 2016. This is one to keep an eye on. Another window into corporate risk is the BBB-AAA bond spread. BBBs are the lowest level of “investment grade” bonds, that often turn out to be not very investable once recession rolls around. So as bond investors fear recession, many BBBs get repriced as junk and the effective yield soars. So where are we at? Again, 2019 has been risk-on. The relative losses for BBB bondholders in late 2018 have almost all evaporated, and clearly the trend is risk-on. And the CCC-AAA spread. Even junk is making a comeback in 2019. Models based around the yield curve are starting to predict recessions coming sooner rather than later. The earliest seems to be the Q2 of 2020. I will try and update this article monthly with new data. Thanks for reading. Comments? Questions? Insults? Have at it.